BearZest and his partner live in the countryside in Portugal. I think what I love most about this room are the glossy, oversized, orange-red tiles on the wall. What an astounding difference this remodeling job makes! To check out the guest house for mature men that they run in Portugal, click here. I really like this, although my favorite bit is the fact that after refurbishing the whole room they still kept the same blinds. nice. I really love the bathroom make-over. Can someone give me the approx. size of the room? Great job. I’m a freak about modern bathrooms renov’s on a diy budget. Did not look to me like they did a whole lot with it. I agree with P&O on the window dressing. Pretty funny. Well, clearly they love that fabric, because it’s on the pillow too! In fact, when you look at the color of the wood on the new vanity and mirror, it’s like they planned the room around it. Maybe it was step one in the makeover project? Tig, I don’t know, but you can approximate if you know how wide a standard shower stall is and visually look at how many of them would fill the room and do a little math. P&O, I’d call it a Roman Shade. BjonPan, what I like is that they didn’t have to do a total gut but the look is very different with a new mirror, vanity, wall tiles and shower stall. These is a very slick design. I really wish that I did not live in a tract home with small bathrooms that are destined thus to remain. But I keep surfing the Internet, still looking, hoping… sounds like an old doo-wop song, huh? What I like very much about this kind of design, though, is its innovation. It gives me a lot to think about. And who knows? Maybe one fine day I will have a bathroom of my own to splash all over the Internet. But thank you for sharing these ideas. Hey Becky – Speaking of bathroom redesign, I wanted to tell you about a tile designer I saw at a design show in LA. I feel like his work should be available to a more wide-reaching audience than just the local design scene. His name is Daniel Ogassian and his trademark is warm and organic textures that add depth to any surface. 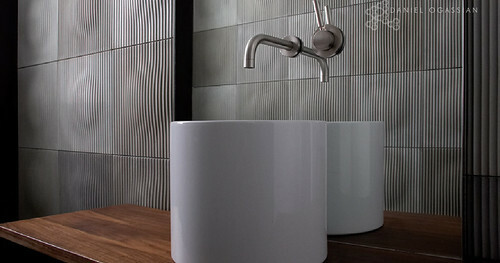 He manufactures and designs clean, futuristic concrete and ceramic wall and floor tiles.